Affectionately known as HOG, Hill of Grace is known as one of Australia's premier wines, second only to Penfolds Grange. With a history spanning decades, vineyards of ancient gnarly vines with vintages going back to the 1950's, HOG is Australia's supreme single vineyard wine and a testimonial to the quality of wine that Australia has been producing for decades. Over the years we have seen a dramatic increase in the price being paid on the secondary market for Hill of Grace that started to falter at the turn of the century. Lately the secondary market price, whilst increasing for older, rarer vintages, has been dropping as the release price each year has been increasing. Whilst the earlier vintages have been increasing in price as they become exceedingly rare, most vintages at auction sell for around $390 per bottle. Complete collections of HOG are even rarer than complete collections of Penfolds Grange. We believe that wine blogs are a fantastic source of trusted information that can be used to guide you towards great bargains and forgotten treasures. We are, slowly, building a list of recommended wine blogs from around the world. 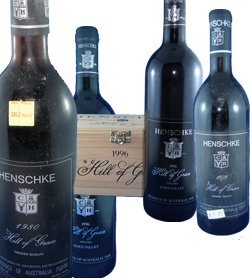 The blogs mentioned below are just some of the ones we have found online with tasting notes or other related material on Henschke Hill of Grace. HENSCHKE Hill of Grace Shiraz, Eden Valley 2003 $0 $0 Bottle Very rare, only one barrel produced.